Standing in the aisle of your favorite grocery story, you may wonder where do almonds come from? Where the almonds come from that are in that can, jar or package may vary considerably, but most likely they're from California, the top producer of almonds in the entire world. Almonds (Prunis dulcis) are the fruits of the almond tree. Although you'll find them in the nut aisle at the store, the scientific name for the delicious treat is a drupe, or the seed of an undeveloped fruit. The answer to, "Where do almonds come from?" is actually the Middle East, but the almonds on your table may hail from the United States, Europe, Africa or the Middle East. Almond trees may be found throughout the Middle East, but especially Syria, Israel, Turkey and Pakistan. Since ancient times, people have cultivated the almond tree for its seeds or nuts. Humans carried almond seeds with them and spread the trees far and wide. Today, you can find almonds growing in North Africa, the Middle East, and portions of Europe and the United States. Anywhere there is a dry, sunny and warm climate, you can grow almonds. Some varieties can also be grown in temperate regions, although the yield may not be as good. The almonds on your grocery store shelves may have made a short journey from California or traveled more than you have. Over 1 million tons of almonds are produced annually. California leads the production of almonds worldwide, producing 80% of the world's almond crop. 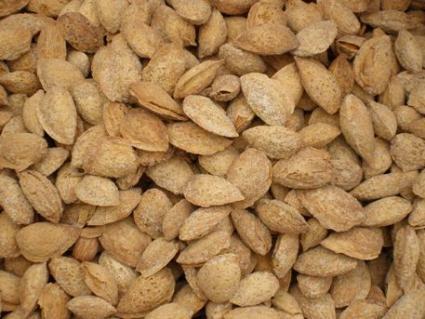 The next leading sources of almonds are Spain, Syria, Turkey, Italy, Iran and Morocco. Recent problems in the areas where almonds come from include a sudden and drastic decline in the honeybee population. Bees pollinate almonds and many other fruit and nut crops, and California especially relies upon its extensive network of bee keepers who move hives from orchard to orchard during the growing season to ensure pollination. Without the bees, there are no crops, since it's the action of the bees that fertilizes the almond tree's flowers and creates the drupe or almond. Scientists believe a virus is responsible for the decline in honey bee populations, along with development that decreases their habitat. Because a lack of bees means a smaller harvest, almond prices have gone up in recent years. There are two forms of almonds: sweet and bitter. Typically, sweet almonds come from trees with white flowers, and bitter almonds from those producing pink flowers. While in ancient times both were used, today mostly sweet almonds are used in everything from gourmet foods to beauty treatments. Almonds are mentioned many times in the Bible, and are considered a symbol of promise. In China, the almond is a symbol of both sorrow and beauty. Indian culture believes that consumption of almonds is good for the brain; ancient doctors often recommended eating a handful of almonds every day to improve memory. Almonds have been used in gourmet foods since ancient times. Whether candied or incorporated into a dish, almonds may be found in many world cuisines. One of the most famous gourmet uses of almonds is marzipan. Marzipan is a paste made from ground up almonds, sweetener and color. Marzipan uses a small amount of bitter almonds mixed with sweet almonds to create its characteristic flavor. Marzipan is a popular gourmet treat in Italy. Around Christmas time, shops are filled with marzipan candies shaped into fruit or vegetable shapes. Because chefs can mold and shape marzipan, it is often used to decorate wedding cakes and as fillings in other confections. Almonds are used in other confections too. Nougat, a confection made from nuts and honey, often incorporates almonds, although it may also used other nuts such as walnuts. Almond butter is a gourmet spread made from ground almonds. Many people who suffer from peanut allergies turn to almond butter. It has a milder taste, and those on a low sodium diet also appreciate the fact that unlike peanut butter, almond butter doesn't use huge amounts of sodium. Almond butter may be incorporated into many recipes or even spread on bread with a gourmet organic jam to create fancy sandwiches reminiscent of peanut butter and jelly. While you can enjoy raw almonds, many almonds are flavored to enhance the gourmet experience. Serve gourmet almonds as party snacks, hors d'oeuvres, or anytime you want a simple yet elegant appetizer. Smoked almonds: traditionally smoked using hickory tree wood, smoked almonds have a tangy, barbecue-like flavor. They may also be salted. Roasted salted: As the name implies, these almonds are slow roasted and then salted to enhance their flavor. Honey roasted: Honey roasted almonds are also slow roasted under low heat, but sweetened with honey instead of salted. Jordan or candy coated almonds: Often given out as wedding favors, they symbolize promise and hope for the future. Now that you know the answer to "where do almonds come from", you're faced with an even more daunting challenge; choosing a flavor! With their health benefits, delicious taste, and relative affordability, almonds are a treat for any table.